By Anna S. Sholl, Esq. 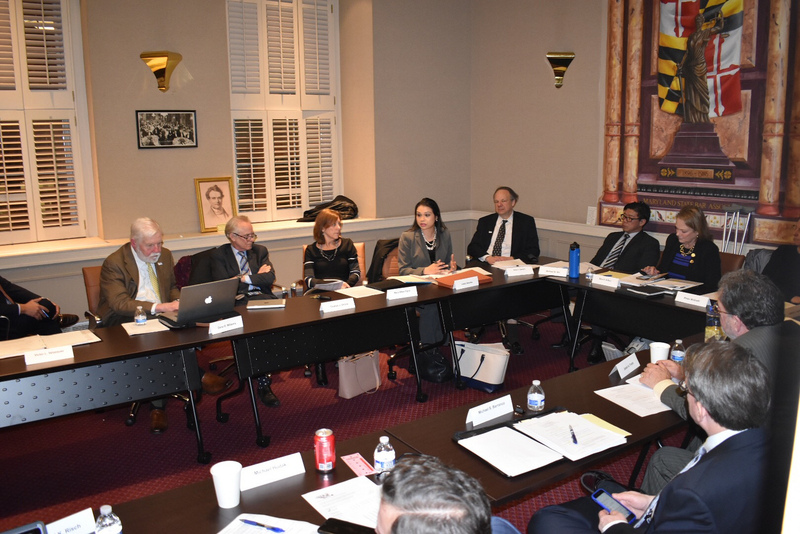 The MSBA Board of Governors held its most recent meeting on January 15, 2019, at the MSBA Headquarters in Baltimore, MD. The meeting started with a report from MSBA President Judge Keith Truffer and a recap of the Annapolis Summit that kicked off the opening of the 2019 Legislative Session in Annapolis, MD. Both Maryland Governor Larry Hogan and Judge Truffer had the opportunity to speak at the Summit. You can view Judge Truffer’s interview on the MSBA YouTube channel or at https://youtu.be/vw6wbgS7T8I. During his report, Judge Truffer also provided an update on the planning for the 2019 Legal Summit & Annual Meeting. At the end of the discussion, the Board approved a small change to the meeting schedule. Historically, the Board of Governors has met twice during the Annual Meeting – once on the opening day of the Annual Meeting and once at the close of the Meeting. This year, the two meetings will be combined, and both incoming and outgoing Governors will participate in the meeting on Wednesday afternoon. In addition, keynote speaker Jeffrey Toobin, CNN Chief Legal Analyst, and other high-profile guests (including Maryland Attorney General Brian Frosh) were announced. Based on the discussion, the 2019 Legal Summit & Annual Meeting is shaping up to be a can’t-miss event. During the Executive Director’s report, Victor Velazquez highlighted the upcoming launch of the newly designed Maryland Bar Journal. A timeline was shared with the Board of Governors, and the new Bar Journal is scheduled to hit mailboxes by the end of February. There was also discussion about potential improvements to the Bar Bulletin. Several MSBA Committees and Sections also reported at the meeting. The first report came from the chair of the Audit Committee, Edward J. Gilliss. He indicated that the MSBA Audit for fiscal year 2017-18 was completed, and that the audit was clean. Richard Montgomery III reported on behalf of the Laws Committee, and noted that there were no new bills to report at this time, given the short amount of time since the opening of the session. He anticipates a more significant report at the Board’s February meeting. Finally, Indira Sharma, Chair of the Young Lawyers Section (YLS), reported that YLS has been very active this fiscal year. The Section has developed and/or sponsored several high-quality educational networking and public service events so far this year, including hosting a swearing in celebration for newly barred attorneys. In March, YLS will hold an open section meeting, featuring a presentation on “Mastering Social Media”. Also, YLS will hold its Annual Charity Event on April 12, 2019, at Gertrude’s Chesapeake Kitchen at the Baltimore Museum of Art; this year’s Charity Event will benefit the Capital Area Immigrants’ Rights Coalition. For more information on the event and/or to register, please visit https://www.msba.org/product/yls-annual-charity-event/. The January Board of Governors meeting closed in executive session for discussion regarding nomination of officers for the 2019-20 fiscal year. The Board elected a 2019-2020 nomination slate consisting of the Honorable Mark F. Scurti (President-Elect Nominee); Maryland State Delegate Erek L. Barron (Secretary-Elect) and Kramon & Graham PA Principal and Maryland Bar Foundation President M. Natalie McSherry (Treasurer-Elect). The next Board of Governors meeting is scheduled for February 19, 2019, in conjunction with the MSBA Mid-year meeting in Towson, MD. For more information about Board of Governors meetings, including access to agendas and minutes, please visit the Leadership page located under the “About” tab of the MSBA homepage (https://www.msba.org/about/leadership/).